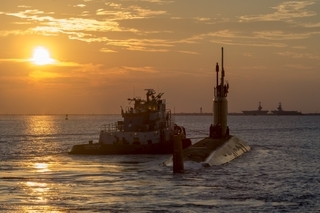 NEWPORT NEWS, Va., Aug. 31, 2016 (GLOBE NEWSWIRE) -- Huntington Ingalls Industries (NYSE:HII) announced today that its Newport News Shipbuilding division has completed post-shakedown availability (PSA) work on the submarine USS John Warner (SSN 785). It was the shipyard’s first PSA of a Virginia-class submarine and the first accomplished without having to put the boat into a dry dock for external hull work. The submarine was redelivered to the U.S. Navy today. The PSA included combat systems and electronics upgrades, hydraulic plant acoustic improvements, and general maintenance on the submarine. One challenge of the waterborne PSA was touch-up painting on the hull. Two dive teams used a coating process that allowed the surface preparation and coating to safely take place underwater.